It is bloody sold out. 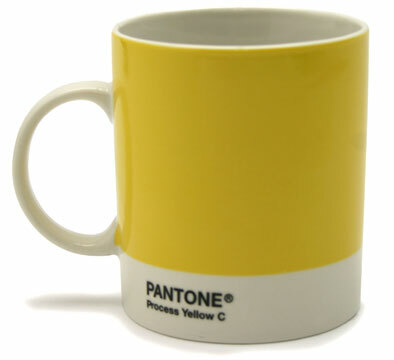 I always want things that have a sold or sold out on them. 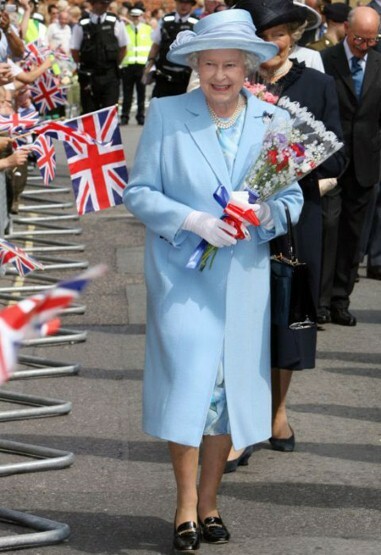 She deserves a sold out celebration for her inimitable style. 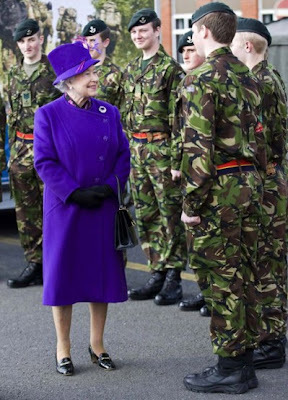 I can hardly wait to see what she wears. I hope my friends in London pull out all the stops and has a royal time celebrating the Queen's diamond jubilee! Perhaps my dear friend Taina (in England) will be inspired by this cake craft shop. 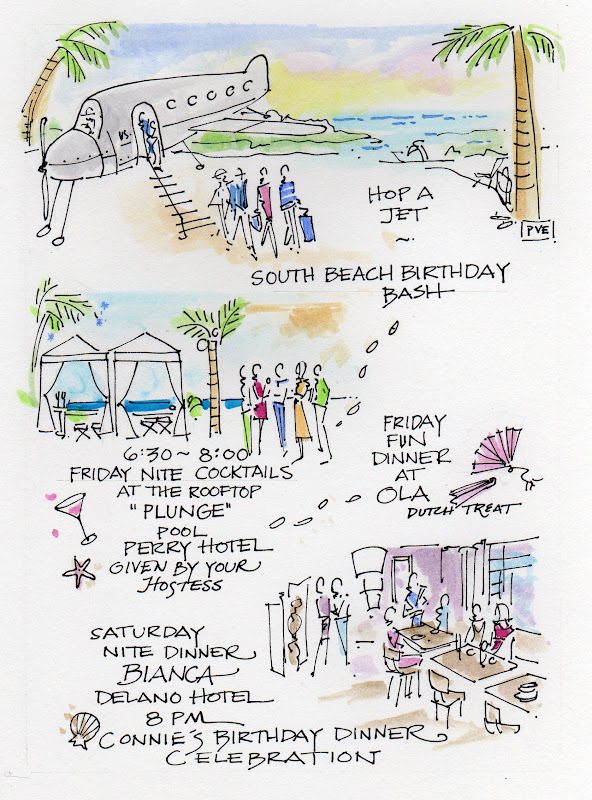 This was an idea for a birthday celebration which I worked on for a special client. Well all my clients are very special as are all of life's celebrations. 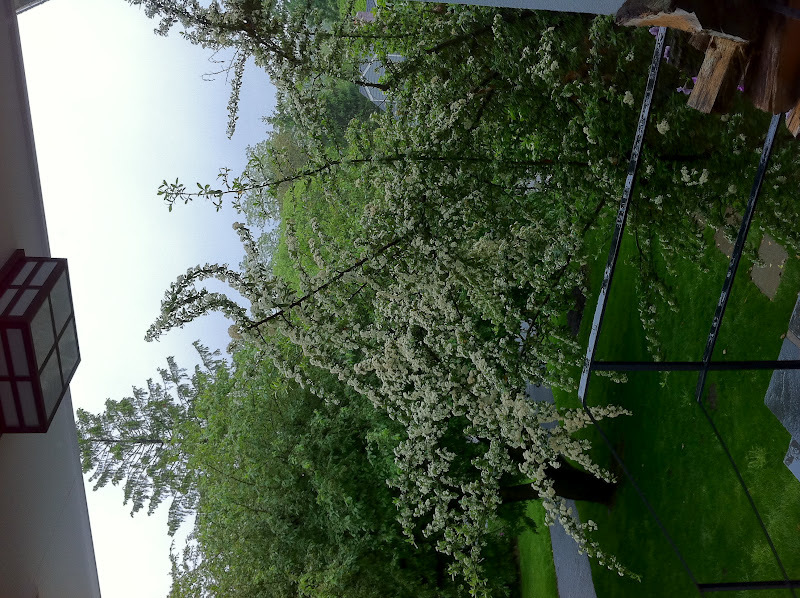 During the next month of June, I am devoting my blog posts to celebrations. 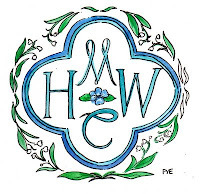 If you have any special tips or personal celebrations or anniversaries that you would like to share, please contact me. My contact is on my web site, pve design. Just love a dog who enjoys a good game of fetch and playing with a tennis ball. 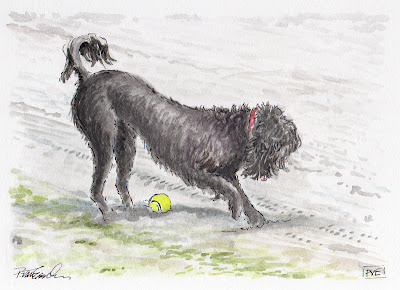 This commission was done for a client who wanted to give her dear man something fun for his office to remind him to take time out to play ball in the sand along the shore with their faithful companion, a Portuguese water dog. 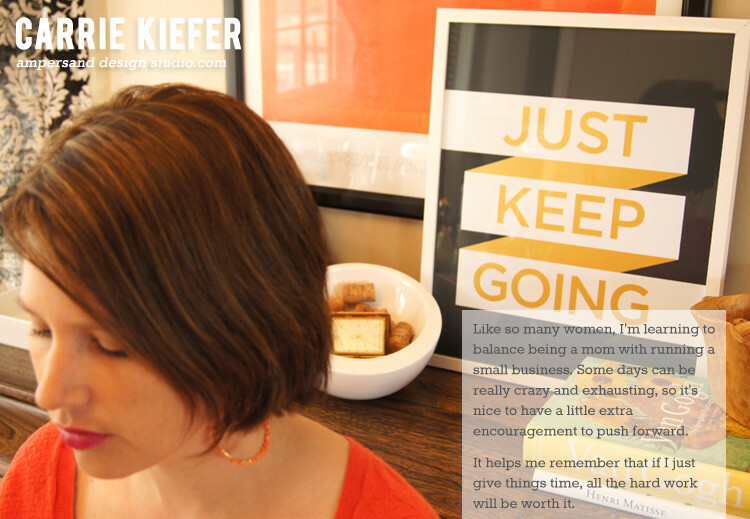 Do you have any keepsakes to remind you that there is more to life than just work? We all need to make time to play ball and have some fun. I love how a companion or child does just that - reminds us to play. 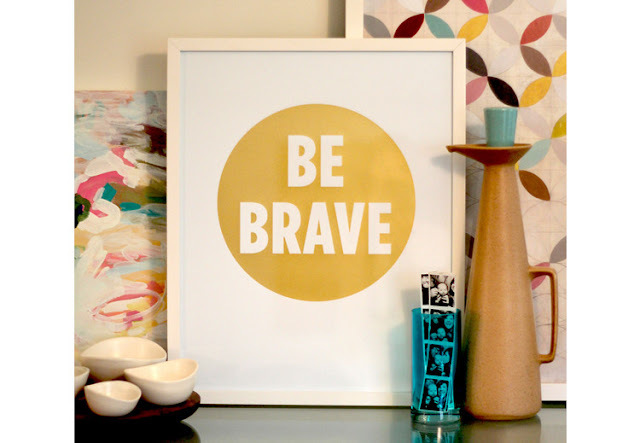 Just a few motivational words to be brave. 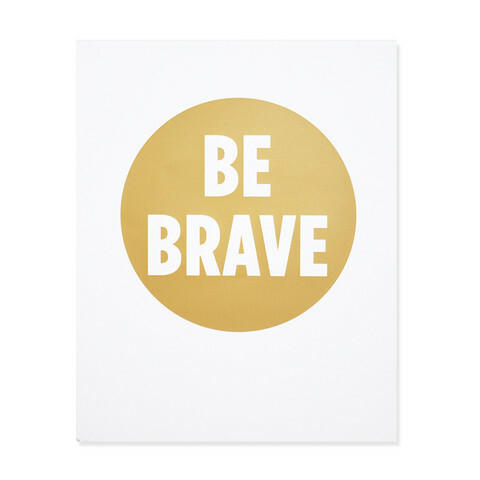 Whatever you face today, be brave for all of those who have and are serving for our freedom. This poster is from Jess LC. 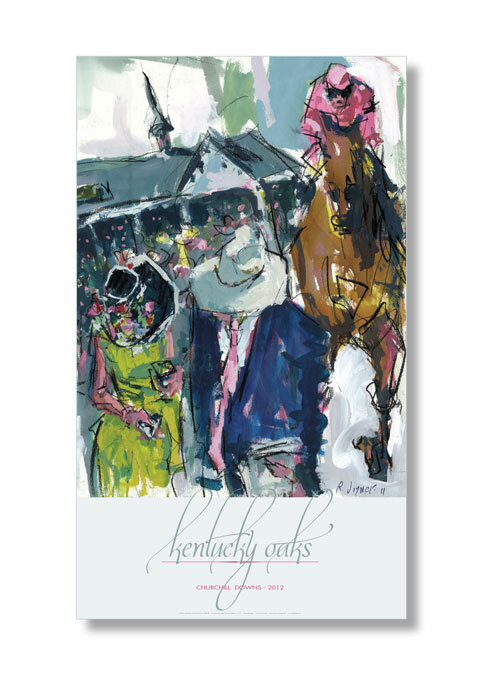 What a great gift for a graduate or for your hero. Lately, everyone I meet seems to be fighting a hard battle and I am in awe of the kindness I witness. 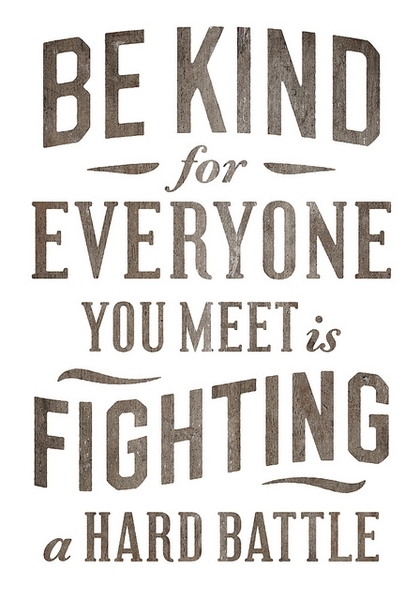 True, each of us has to pick our battles but being kind to those who are fighting some battle truly does ring loud and clear especially in light of this Memorial Day Weekend. Take a moment to express your kindness and to remember those that fought a hard battle for our freedom. The only stipulation was that my artfully prepared lunch be vegetarian. 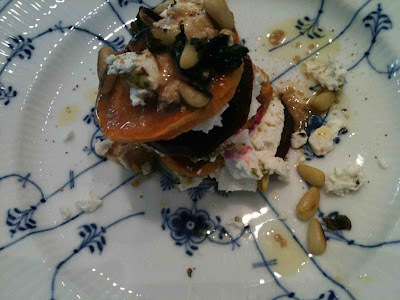 No meat, however cheese would be welcomed so with that in mind, a roasted napoleon of beets, sweet potatoes, goat cheese was on the menu. The anticipation of their arrival brought me right on time to the train station to fetch these fine women. Our plans had been arranged months in advance to let me know that they would be traveling to New York from their respective homes, Carol from Toronto and Michelle from Vancouver. It is always nice to have special treats to look forward to. Special visitors deserve special cuisine. They came bearing the most lovely flowers, bubbly and house gifts which deserve an entire post. 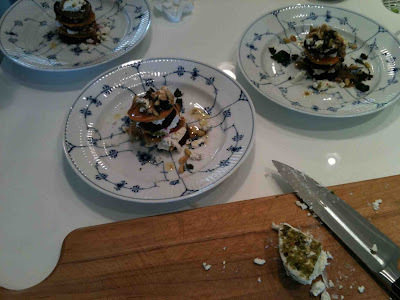 I believe in letting your guests work for their lunch so they assembled these sweet stacks and then I topped with sauteed beet greens and roasted pine nuts, drizzled with truffle oil. Accompanied with a flute of bubbly and enjoyed with my wedding sterling. This was followed by a fresh green salad and then some fresh berries with kefir. I do believe in living and enjoying an artful life. Dining at home is so much more relaxing and intimate. Go here if you would like to see Carol's post. I am so delighted they took the time to make the trip and sharing The Historic Home, "Sunnyside" of Washington Irving was a treat. Thank-you to Carol and to Michelle for coming to visit and for your down-to-earth friendship. I think I need to visit Canada next. I am giving myself a present. I shall be attending the Jess LC, Make under my life, Business with Intention workshop in New York in June. What was the last gift or present you gave to yourself? 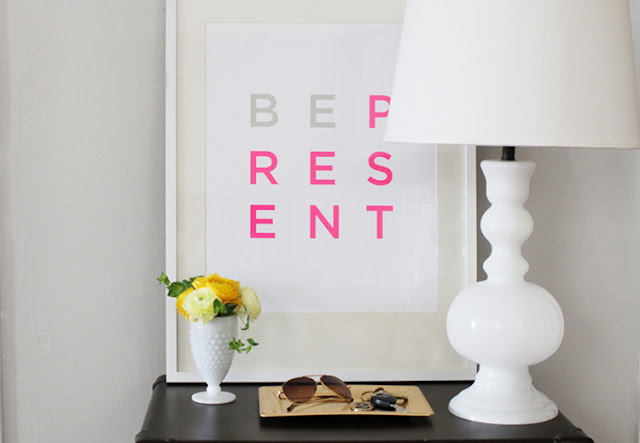 We all need reminders to "Be present" - to live in the moment and to Dream Bigger! 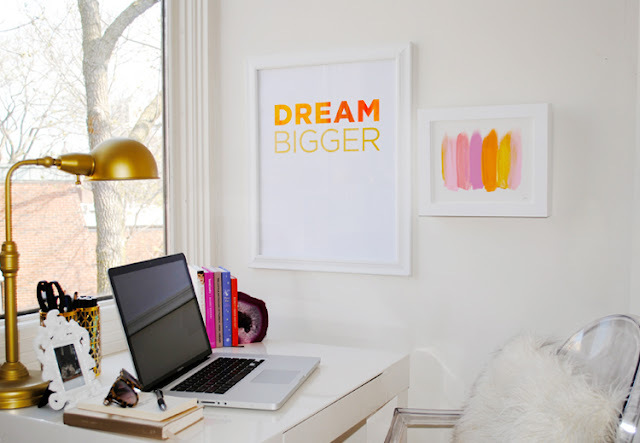 Do you have a dream that needs a little attention or a gift to share? Very often these little gifts are just the thing to keep us going. These posters would be the perfect gift for a graduate, a new Mother or a friend. You can find them all at Jess LC. 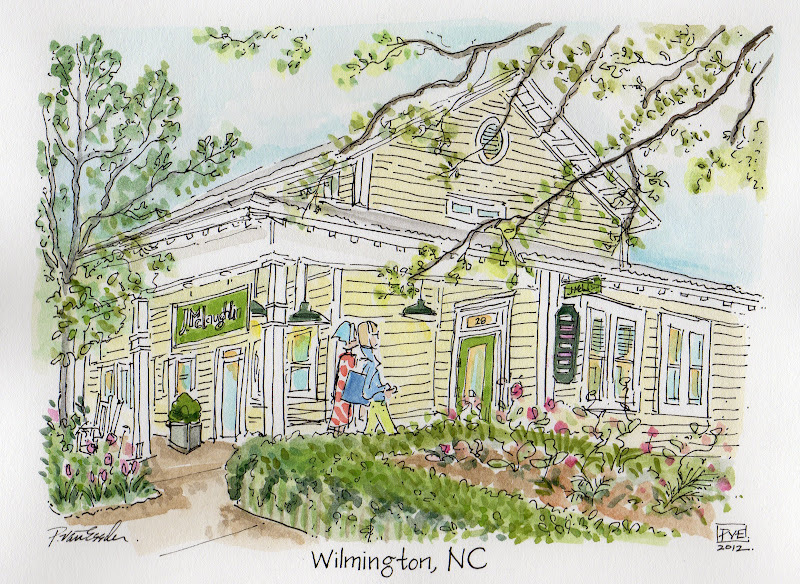 The sketch I shared with you last week is now complete. 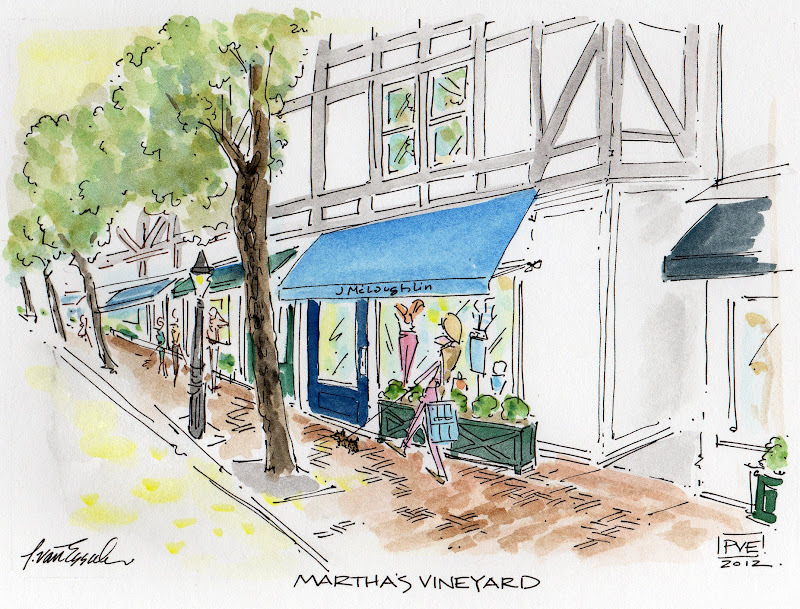 A new J.McLaughlin store will soon open on Martha's Vineyard, Edgartown, MA. 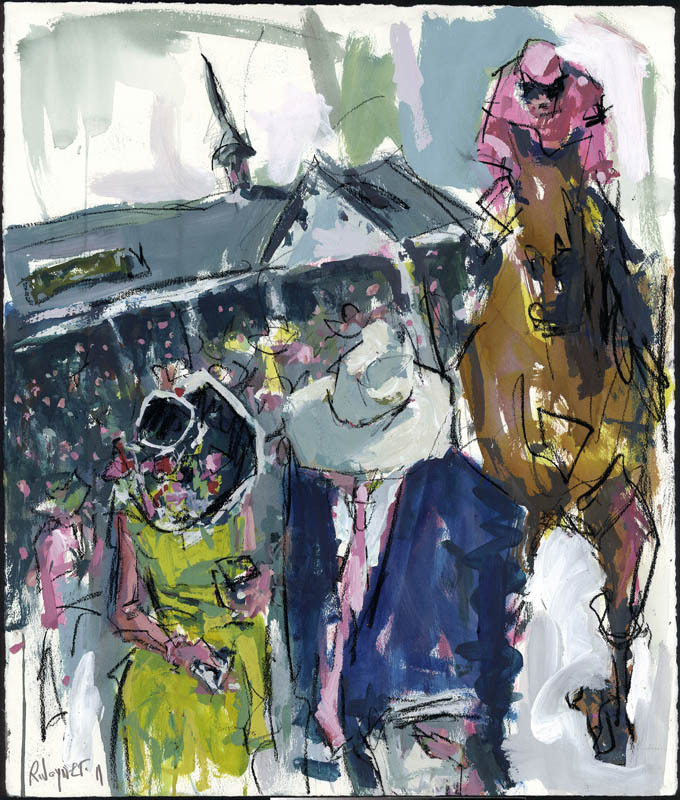 This was the first rough. 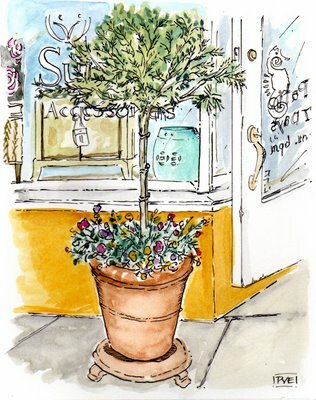 You can see that I added more trees, planters and people strolling which added to the overall perspective - bringing one's focus to the shop. The sun is beckoning in the distance and dappling yellow light on the pavement. The sun is such a tease as summer-time rolls in. 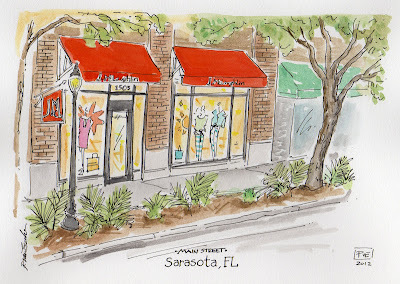 I have a series of shops and fun perspectives coming up. 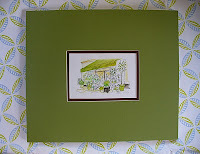 Another day of rain but that won't stop me from finding the sunny side of life in my studio! Passion is motivational. When you really love something it can give you all the will and desire to move forward. I thought you might need a little inspiration this week. Are you passionate about something? What do you appreciate? and challenges, in a real way both to yourself and others. There is no need to be quiet. Run free and explore your life. to proceed in power, love and a sound mind. Keep it close, never exchange it. For it is like hidden treasure waiting to be discovered. Just a few random things for you to muse on. 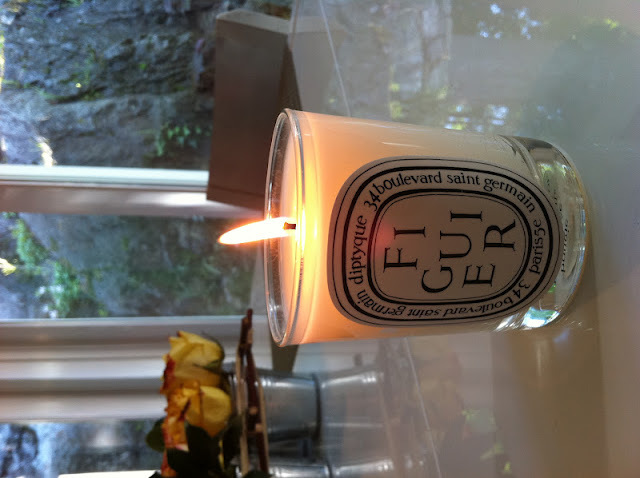 This diptyque figuier candle arrived on friday that I won from Vicki Archer. This is the magical view from my front door. Go ahead and muse on that view. The amount of rain has clearly left everything lush and green. Here I am yesterday morning getting ready to attend an all day celebration. Go ahead and muse on that. I treated myself to a new frock. The fabric is a crispy stretch cotton. I love it. 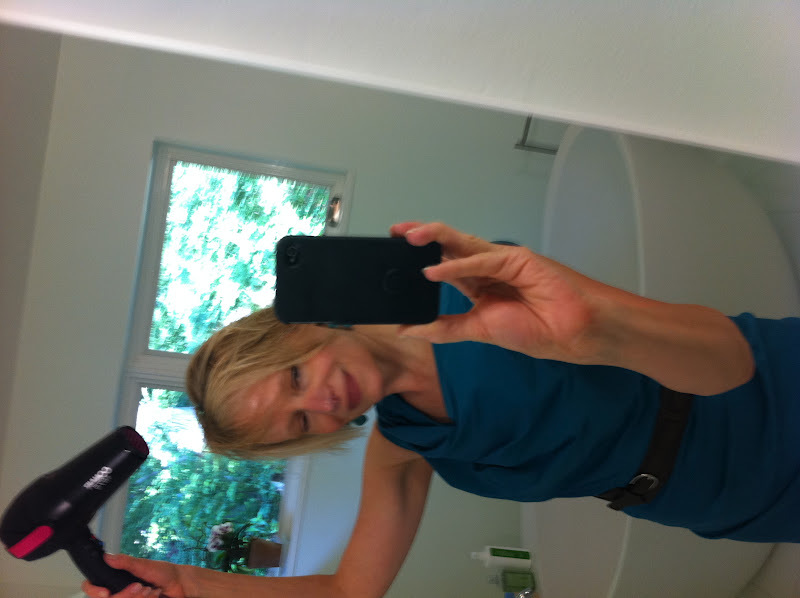 Imagine how skilled I was at blowing my hair dry and taking a photo, if only I were skilled at keeping my eyes open. I never seem to have them open for a photo. Now muse on and enjoy your Sunday. 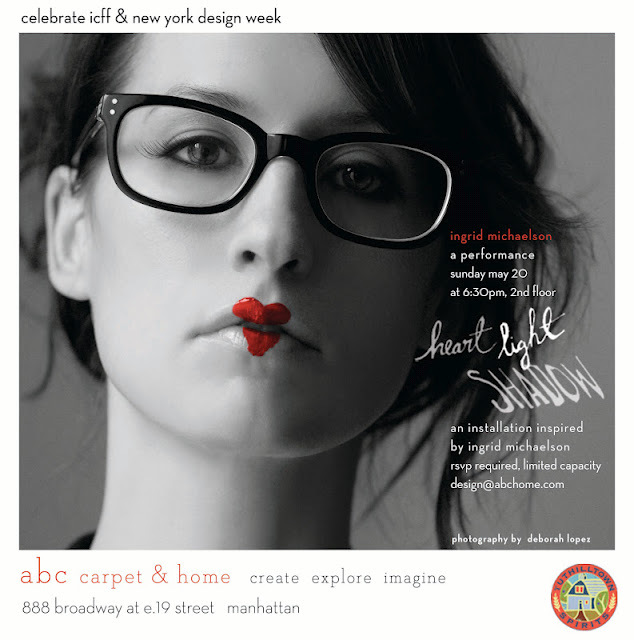 Oh, I am going here tonight to ABC home to hear Ingrid Michaelson. I won tickets to this from a Bloomsbury Life. I thought I would share an illustration and shop that is "in the works" - as you can see, I have not yet applied water color to the building since I needed information as to the colors of the awning and the door. Often I like to do a loose rendering to get the perspective working and from left to right. I will be back after this one is completed and show you the final artwork. My husband shall be dining tonight like a king. It is not the fact per se that I am jealous that he will be dining at Per se in New York, it is the fact that I will not be by his side to taste the artfully and skillfully prepared cuisine. Thomas Keller has devoted his life to creating food to make people happy. My husband has devoted his life to banking and solving problems. 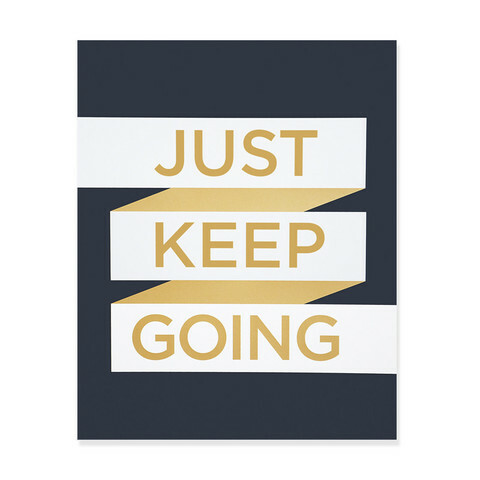 Very often those problems require long hours, countless meetings, conference calls and more. 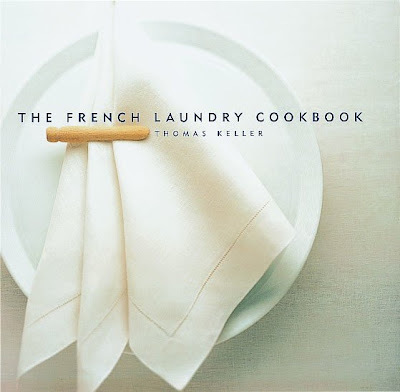 If you want to invest in a beautiful book, The French Laundry Cookbook is simply exquisite. I am hoping that there will be a small "doggie bag" brought home for me. I can't wait to hear all about his dining experience. 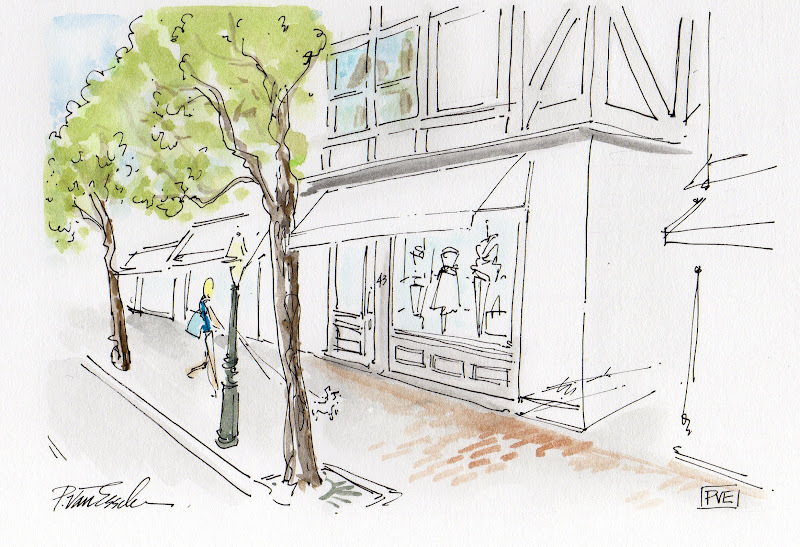 Have you found your "joie de vivre?" 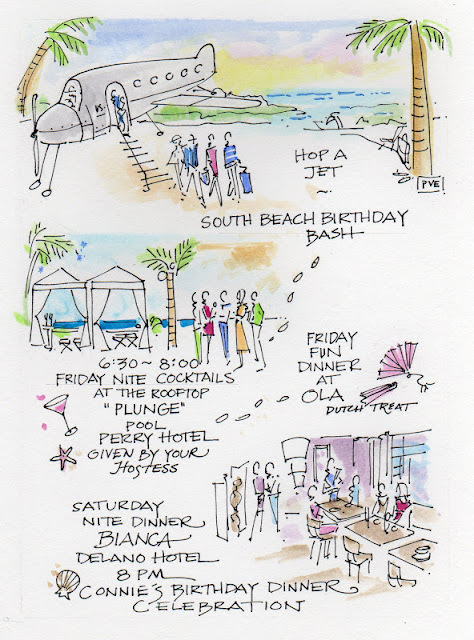 How do you create or find exuberance? Is it your garden, taking care of your home, your family, your work? Could it be cooking, creating a meal or baking? Mine is capturing moments in time and then sharing it in my art. Mind you life is pretty energetic around here at our home. I am happiest when I capture artwork in a loose fashion with energy. When I labor over something, it suddenly looses fervor or spontaneity. It's like someone working too hard to sell you something. Places. Parties. People. 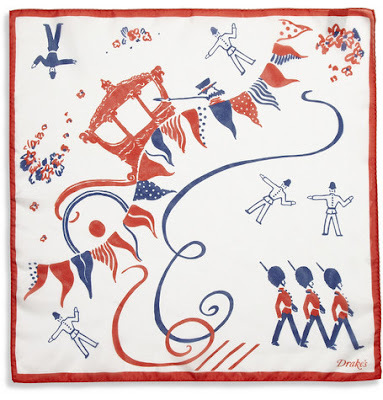 Pets and Posh things. I work with a local framer who is passionate about framing my art. 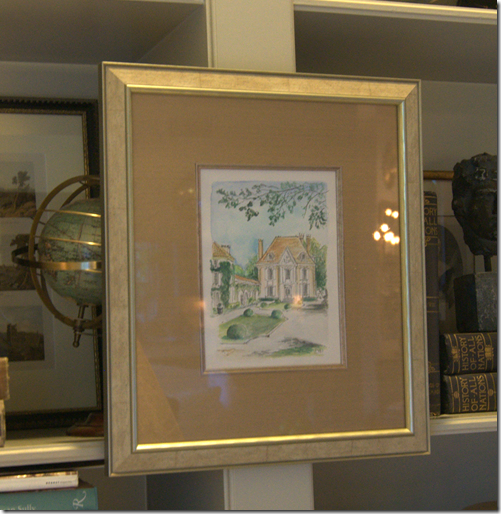 He really rocks when it comes to framing. 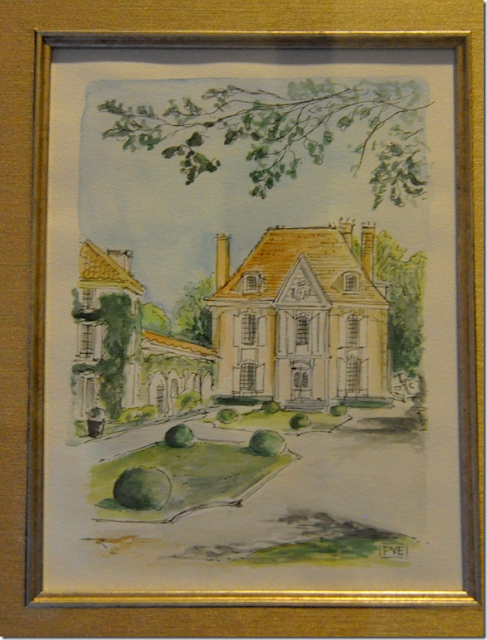 This one I had sent to Joni at cote de Texas a few years ago because I know her passion is all things french. If you could have anything illustrated by me, what would it be? Tell me what subject would bring joy to your life in a pve work of art? 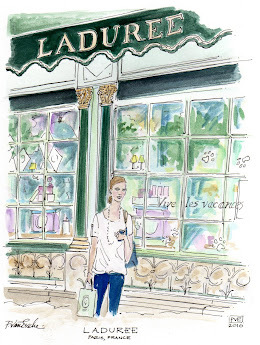 I love this illustration I did a few years ago for Sur La Mer. 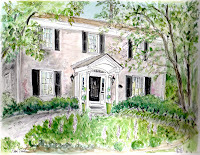 If you have the time, take a hop over to Melissa's sophisticated and chic site. My herb garden has been planted and I would love to add some topiaries to my back patio. Do you have a topiary? I am thinking rosemary might be nice. 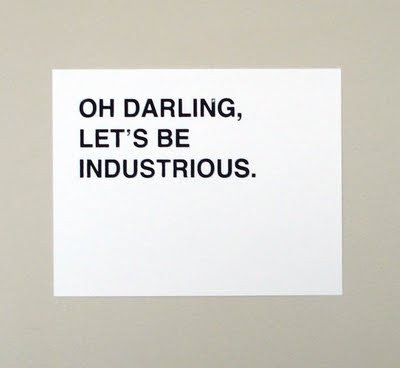 The word industrious does have a darling ring to it. So much more so than hard working. and hard working places to get the job done. 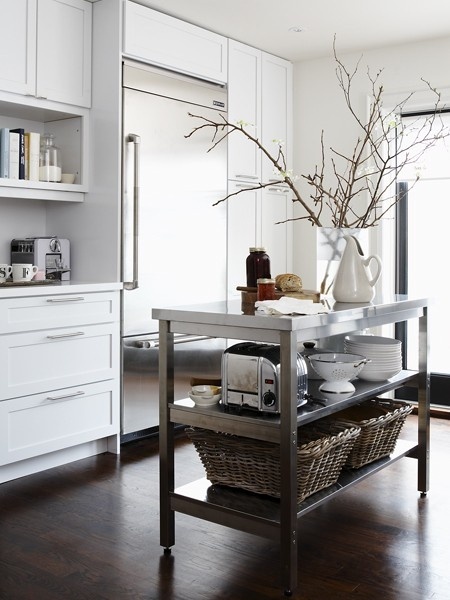 How simple yet efficient is this stainless 3 tiered working island or breakfast bar. This room has great style with the tiled wall and floor. Did you spot the drain on the floor. The basket under the stainless sink has such style. 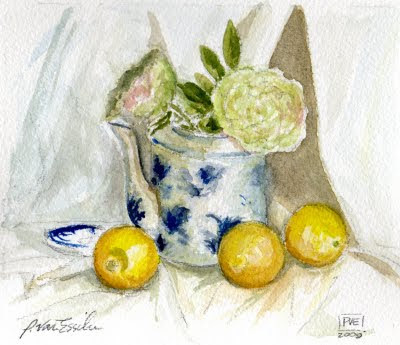 How wonderful to do laundry or create simply stunning floral arrangements? 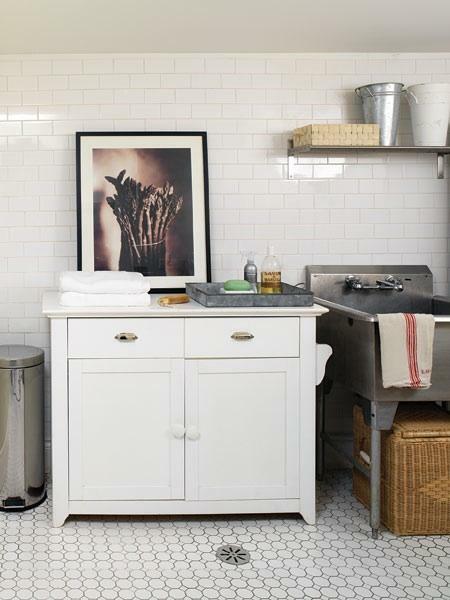 The stainless steel trash bin on the left is another touch of genius to keep the room tidy. 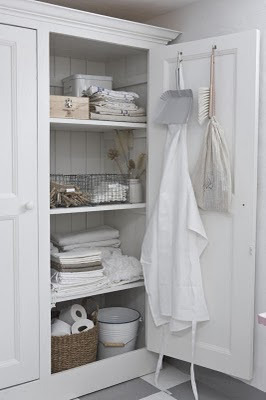 A proper linen closet with ample shelves for storing is rather charming yet hardworking. I especially love the basket and the enamel bucket. What items do you rely on to add an industrious charm to your home darlings? My Mother has a kind heart and a positive attitude. She reminds me to smile and to be a fountain of gladness. 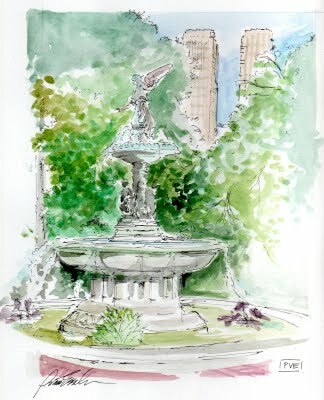 of The Bethesda Fountain notes. 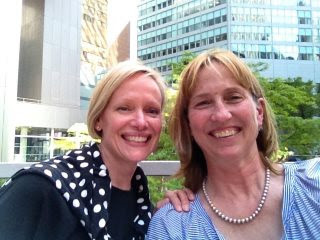 Yesterday, I had the pleasure of meeting my college friend Denise in the city. We met at the MET and toured ninety percent of the museum, walked miles, had a scrumptious lunch and shopped and smiled. We chatted, laughed and walked. It felt so nice to take a break and see a good friend. Can you believe that we have college kids and both been respectively married to great men for over 20 plus years? We are both still smiling. How lucky are we to catch up and spend a great day with one another. Now I must make plans for our next visit! Mother's day came a wee early. My dear husband returned from visiting his parents and brought me a lovely bottle of HERMES "un Jardin en Mediterranee." I especially like that we can share it as it was intended for both guys and gals as it has a woody green fruity scent. I saved the box for the lovely artwork which I found inspiring. Funny, I never thought of cacti in my garden, but they are all over the place in the South of France. 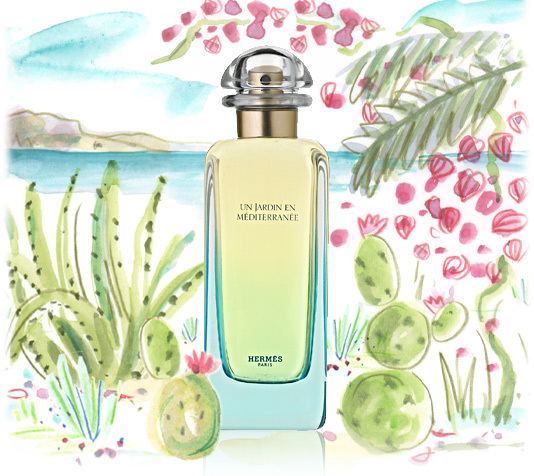 What is your favorite fragrance from "un jardin?" 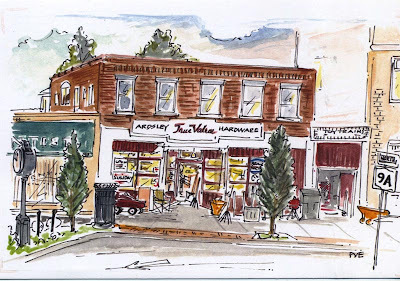 When I moved to this village one of the first spots I frequented was and still is, our local Ardsley True Value Hardware store. Always greeted by our local owner Joe with a "Good Morning" to which I would reply, "Good Morning to you" and how are you today? Joe always answers "Working hard and loving it." I took it upon myself to give this sketch to Joe one fine morning and he proudly displays it on his computer screen and postcards that sit on the counter for customers to take. 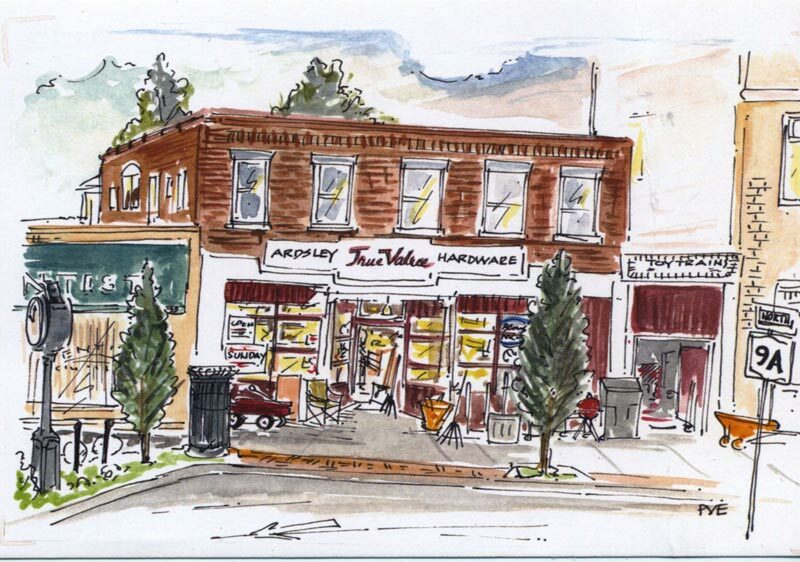 Do you have a local hardware store or shop that you love to visit in your village or town? Do something special for your shop or shop keeper and let them know how much they mean to you. Each week I seem to pop in for something I need, lightbulbs, cleaning supply or various item and I am always so grateful to hear a whistle or a kind word. Did I mention that Joe is an actor and a runner? Now you see why he works hard and loves it. 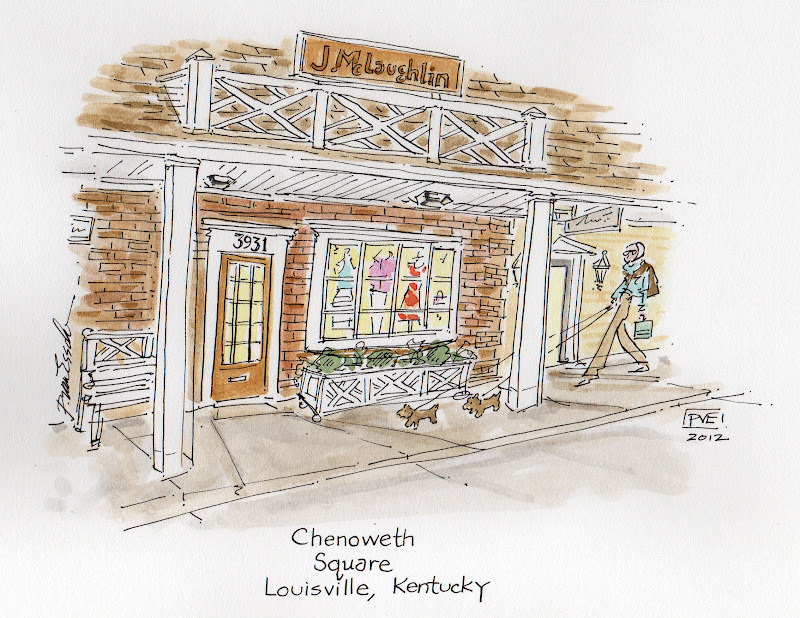 Chenoweth Square in Louisville, KY.
What's that quote, "It's not how far you've come, it's where you started." 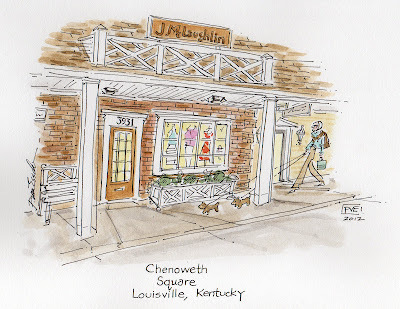 I was born and raised in Louisville. 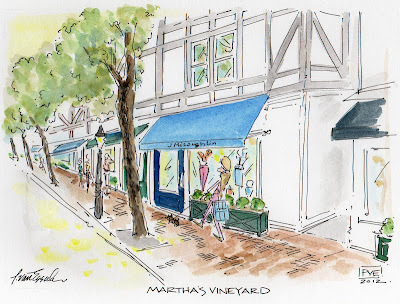 All roads do have a way of connecting and leading us back to where we started, in this case, make it more stores to connect us all. More sketches for me, pve. I have been giving lots of thought to living each day with a little self-gratification. I give you permission to take a bit of time today and treat yourself to something purely selfish. It's not that I wouldn't be all too happy to share my lunch but sometimes we all deserve to treat our selves to something special. 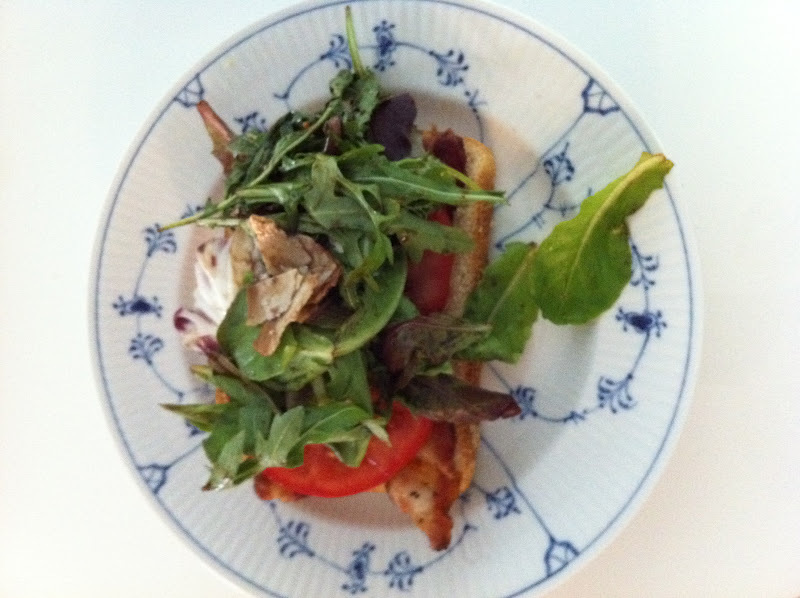 The above open face bacon-lettuce-tomato brought me great happiness on saturday. 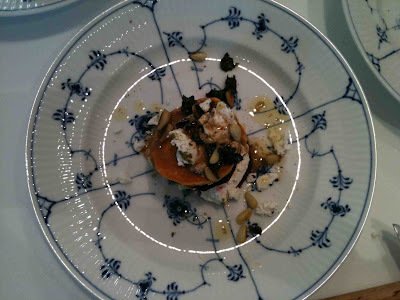 Served on one of my royal copenhagen plates that I bought second hand for a song years ago. The bits of shaved parmesan were tossed in the salad and dressed with balsamic vinaigrette. Mind you, all this after a wee nap. I awoke feeling flushed and re-freshed. All this made me feel like a Queen, and I did it all by myself without any courtiers. Do you take time out to live by adding pleasures to your day? What I am referring to, does not involve spending tons of money. Why do so many people deny themselves time to live life with a little self-gratification? Standing and eating or running and swallowing really don't do it for me. What do you take time for in your day that brings you joy? 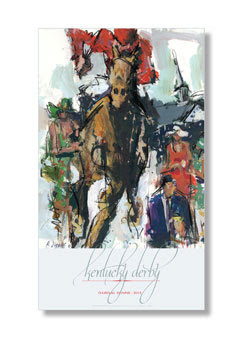 The 138th running of The Kentucky Derby will take place on Saturday. 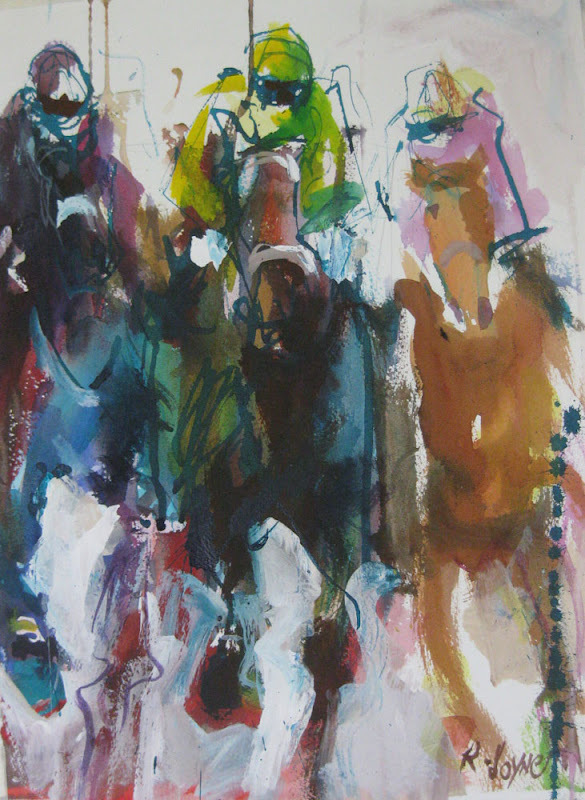 This work of art by Robert Joyner makes me feel as though I am right there in the mix. 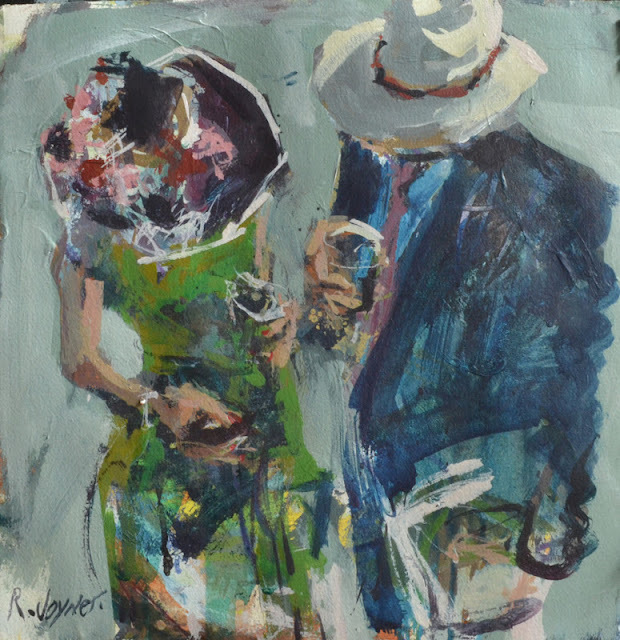 This work has a sort of "Mad men" air to it, love her green dress, the red nails, mint juleps in hand and his classic southern proper navy blazer and straw boater....I admire the fierce and fast brush strokes. Hope you will be watching the race with a mint julep in hand. 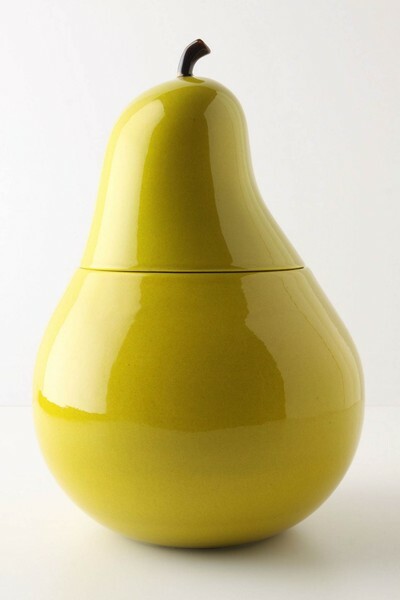 Found this sweet glossy earthenware anjou cookie jar here. 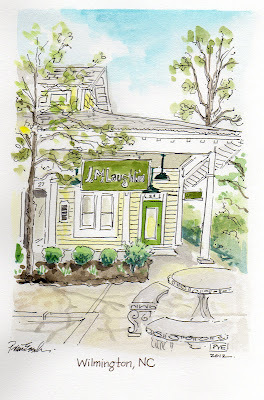 Hence my craving and dreaming in anjou colored began. 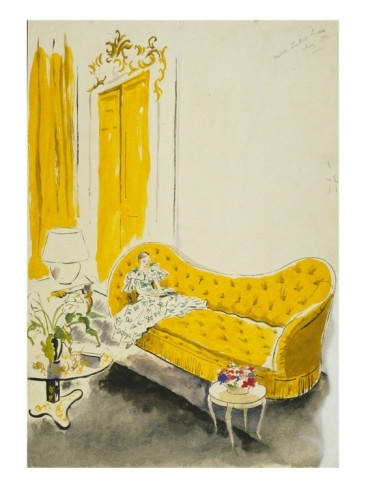 Care to join me here, just look at this lovely anjou yellow tufted Cecil Beaton illustration? I found the perfect shade of anjou dress to wear to the party. I think I need to find some silk taffeta and dust off the sewing machine. What a sweet party party favor or invite to a party of Joy. Could be for any sort of celebration, right? Love the idea of giving a "process color" mug to my guests. 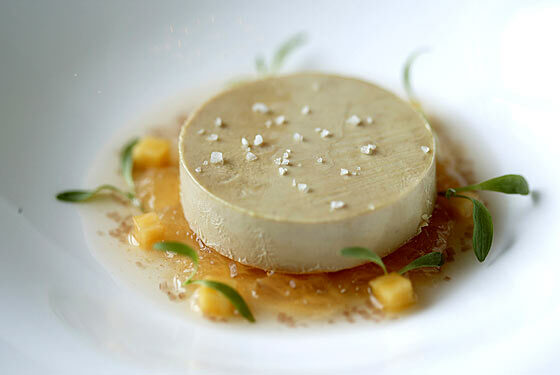 Something about anjou that radiates sunshine. 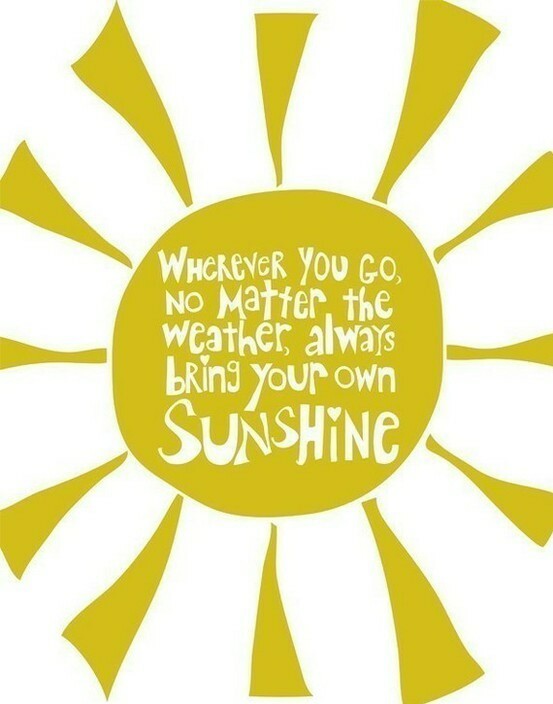 Rise and shine and bring your own sunshine to the party! all images from my pinterest boards.